According the deal, the Vietnamese university will grant 80 training scholarships for the Royal University of Phnom Penh and the Chea Sim University of Kamchaymear. The former of the two will receive scholarships in English language, IT, applied biotechnology, accounting, and mathematics teaching. Meanwhile the latter will receive scholarships in in construction, food, and environment technologies, as well as botany, and aquaculture. The scholarships will prioritise students residing across the four Cambodian border provinces of Sihanoukville, Kep, Kampot, and Ta Keo – all of which are partner localities to the Mekong Delta province of Kien Giang. Scholarship holders will be sponsored throughout their study in Kien Giang. Regarding cooperation in scientific research, the Kien Giang University will send experts to the two Cambodian universities to jointly carry out clean farming models, build high-tech models for the production of short-term plants, and to run studies on industrial trees. 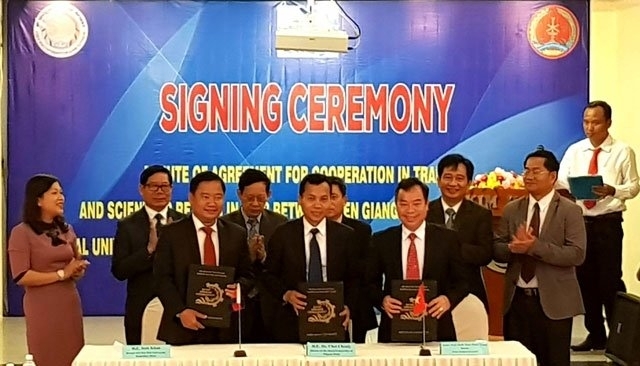 Rector of Kien Giang University Thai Thanh Luom said the three establishments will collaborate in studying industrial trees, particularly cashew, to help Cambodian development. He also highlighted their joint research in rice production and organic agriculture. According to political counsellor Le Thanh Tac at the Vietnam Embassy in Cambodia, who attended the signing ceremony, the Vietnamese Government grants more than 1,000 short- and long-term scholarships to Cambodia per year, while Cambodia helps Vietnam train students following requests from Vietnamese public agencies and sectors.